The History of the Passive Solar Greenhouse - Why Build? Why Build the Passive Solar Greenhouse? This greenhouse will enable you to garden easily in difficult situations such as: short season, windy, low night time temperatures, animals eating your garden, low rainfall, high altitude, urban gardening, low humidity and/or cold winters. This greenhouse will allow you to garden all year with a wide variety of vegetables, regardless of where you live. Because this greenhouse is permanent and passive solar, it is much more effective than season extension. Why I personally decided to build a greenhouse. For three years back in the mid 1980s, I was a professional organic landscaper in Atlanta, GA (USA): Zone 8, only 800 feet above sea level, approximately 50 inches of rain a year, and a population that loved its trees, extravagant foundation plantings, and yet gardens with gusto despite the challenges of wind and harsh climate. 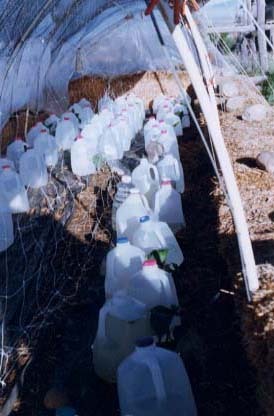 After ten years of experimenting with straw bales, poly-covered tunnels, and several kinds of row cloth-all in an attempt to stretch the pitifully short 90 frost-free-day summer growing season - I was discouraged. 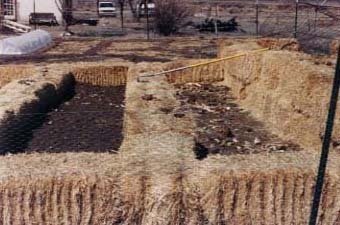 March - Construction of strawbale walled garden for wind protection and water retention, plus a cloche in the upper left of photo. 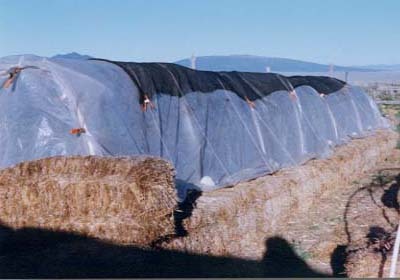 This system worked well for about eight years, although the straw bales were messy and needed to be replaced every three years. The one mild winter the moles moved in and ate several hundred dollars worth of perennials. Late April - A homemade poly tunnel for wind protection, water retention, greater humidity and warmer nighttime temperatures. Tomatoes are in the walls of water. This large tunnel was too cool at night for peppers and eggplant. Early June - A homemade poly tunnel specifically designed for eggplant, peppers, and cucumbers (our summer night time temperature is always less than 55"F). This site becomes the passive solar greenhouse. The coldest our winter got this year was -14"F. The greenhouse did not freeze and the soil temperature was never lower than 50"F. By using reflective insulation on the glazing wall at night, this greenhouse will stay above freezing at much lower temperatures. 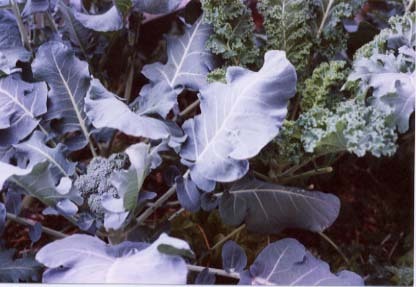 Beset by 50 mph winds and hail the size of golfballs, my fall garden looked like it had gone through a Cuisinart. All the poly tunnels were damaged, the mole population had skyrocketed, and temperatures in the teens in mid-September killed the peppers and eggplant just as they were reaching full maturity. It was time to build a greenhouse! 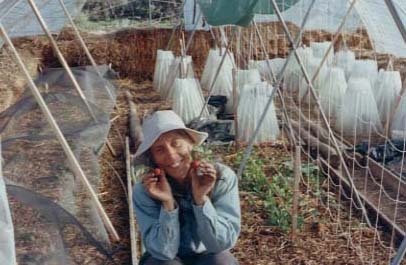 However, the available mail order kits of polycarbonate or glass, and the polyethelene hoop houses are both what I refer to as �freeze or fry� style greenhouses. Because there are all glazing and their foundations aren�t insulated (or don�t exist) they must be heated in the winter to prevent freezing. They also get very hot in the summer and must be well ventilated and cooled. So I decided to design and build a passive solar greenhouse that would fulfill the sustainable agricultural principles of affordability, usefulness, durability and efficient use of local resources. d) using shade cloth as necessary.